With a smart Galactic Theme in design and appearance, Genesis Casino manages to catch your eye right from the loading screen. And things only get better from then on, as you feast upon a huge selection of 1300 games spread across categories like video slots, jackpots, table and casino games, and even arcade stuff. For a casino that has been in business only for a year or so, having opened in 2018, Genesis has already gathered a loyal fan following across the world. South African players are also a growing crowd at the casino, due to a host of benefits including full support for Rands in both deposits and withdrawals made at the casino. While doing all that, the casino has not compromised on safety either. The website uses the latest 128-bit security algorithms to ensure that all your personal and financial information remains safe and secure. Accessibility is yet another major strength that has helped Genesis casino climb the popularity charts. It can be opened on your PC, MacBook, iPhone, iPad, and just about every Android, Windows, and Blackberry devices out there. Many casinos have a less than positive reputation when it comes to processing withdrawal requests from players. Genesis, fortunately, does not belong to that club. All withdrawal requests placed at the casino are handled with utmost speed and diligence. So this is a casino that prides itself on its customer-centric approach. If you are a new player at Genesis, this is the offer that greets you. It promises up to R15,000 as matching bonuses, spread across your first four deposits at the casino. You have to deposit a minimum of R150 to become eligible for the Genesis Casino bonuses. When you deposit your first R150 or more, the casino matches that amount 100%. One the second deposit, the matching percentage is 50, but the max bonus amount is R4,500. So the more you deposit, the more Genesis pays you! Deposits 3 and 4 get an identical treatment, with 25% matching bonuses that can get as much as R4500. With all four bonuses, you could potentially get R15,000 from the casino! 300 free spins are also on offer as part of the Welcome offer. These spins can be used on specific games mentioned by the casino, usually in the slots section. The free spins are delivered immediately after your first deposit. Your mission is simple: deposit and wager R750 every week at the casino, between Monday and Thursday. So, what’s your reward for achieving this feat? A bonus of 25% delivered promptly to your account on Fridays, with a max ceiling of R1500! Spend R150 at Genesis casino on weekends and the Casino will reward you with free spins on popular slots games delivered straight to your inbox on Monday mornings. The perfect way to counter the nasty Monday Blues! A one-time bonus that you can use any time you feel like you need a little encouragement. All you need to do is deposit some cash (minimumR150) and pick this bonus while you make the deposit. It will shower maximum R3000 in three trailing bonuses to bring a smile to your face! Spending money online can be quite risky in the age of cyber criminals and hackers. Genesis Casino understands this very well and has done more than most to help their clients feel safe. The site uses advanced 128-bit encryption and advanced SSL technology to protect all personal and financial data. And they have also partnered with the best, most reputed names in the world of electronic payments and transfers. You have the option of picking VISA-MasterCard, Neteller, EcoPayz, EasyEFT, Skrill, or SA Bank Online Transfers for making deposits and withdrawals on the casino site. The best part is that you no longer have to convert your currency into GBP, or USD. or Euros any more. Genesis casino accepts SA Rands at no extra charge! Most of the transactions are completed instantly, with the exception of bank transfers that may take up to a week to credit into your account. Genesis Casino has a three-pronged approach to customer care. Besides a well written and detailed FAQ section, the casino offers you the following routes to reach out to its customer care staff and resolve your doubts or issues: a toll-free number (SA), email, and Live Chat. The Genesis Casino Customer Care service is available 24x7, 365 days a year in at least one of the above-mentioned methods. With mobile phones, we now have the freedom of taking our movies, music, and games everywhere we go. Why should casino gaming be any different? Genesis Casino allows users to play their favourite games whenever they want to, no matter where they are. The casino services are easily accessible on all major mobile devices, without the need for app downloads or anything of that sort. This casino uses the same HTML5 based platform for its desktop site as well as mobile versions. You will be opening the same casino website on your browser, regardless of whether it is your desktop PC or your Android/iOS mobile. And both will function equally well, thanks to meticulous optimization carried out by the casino. Bonuses are no use if the casino doesn't have your desired games. That is a very remote, almost impossible risk with Genesis Casino, simply because they have one of the biggest collections of quality casino games out there. With more than 1300 titles available, there is something for every gamer out there. There are over 700 slots games of various designs and themes for folks who love playing them endlessly. Casino veterans will love the live lobbies managed by companies like NetEnt, Evolution Gaming, Quickspin, Play’N Go, Red Tiger & ORYX for their choice of games and secure interface. There are numerous rooms of Baccarat, Blackjack, Roulette, and Poker, with different languages, and different stakes as well. But if you are more interested in unusual games, the Genesis has a good selection of arcade games, scratch cards, and Keno to keep you happy. Progressive jackpots are also there, with the promise of hundreds of millions of Rands to the lucky winner. 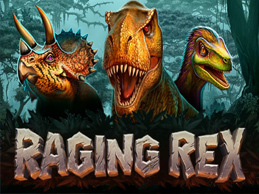 Released in January 2019, Raging Rex is one of the latest video slots games from the popular Swedish developer Play’n’Go. As the name suggests, this is a Jurassic themed game filled with Dinos, fossils, and meteors. It has 6 reels and a massive 4096 pay-lines. The graphics are a treat for the eyes, with great animation and well-drawn images. The game is set in a prehistoric forest where the feared predator T-rex is roaming, on the prowl for its next meal. The low-value symbols are insect fossils, while the dinos make up the high-value symbols. Velociraptors are the most valuable, capable of multiplying your stake by 7.5x if you can score five of a kind. Predictably, the T-Rex is the wild card in this game. It is capable of advanced plays like Rampage and Raging Rex. Rampage makes other reel symbols scatter while Raging Rex is an advanced stage with the potential for free spins and stacked multipliers. Free spins are activated when the meteor symbols appear. When all the bonuses fall in line, players can earn as high as 5000x their stake in Raging Rex. Admittedly, that doesn’t happen too often in this highly volatile game, but there is still a healthy chance since this game has endless replayability. If you like wizards, witches, and sorcery themes, then you will find plenty to enjoy in NetEnt’s latest entry in the world of high-quality slots. Golden Grimoire was launched in January 2019 and has all the hallmarks of a typical NetEnt game. The graphics are stunning, and the overall design of the reels and symbols simply top notch. On the technical front, Golden Grimoire is a 5-reel slot with four rows and 40 fixed pay-lines. The volatility in this game is low-medium, with an RTP setting of around 96.44%. The symbols on the reels include diamonds, clubs, hearts and spades (low value), and gems held by bugs, spiders, snakes, and other dark creatures (high value). The mystery symbol is a spell tome, with the ability to transforming other symbols into a single random symbol. During this transformation, a wild symbol can also appear in the form of a golden skull. Scatter symbols can grant you free spins when they land in a particular sequence on certain reels. Golden Grimoire may look a bit complicated on the first appearance, but this is a very simple and user-friendly game. With low to medium volatility, the highest magnifier you can expect is somewhere around the 1000x mark on your stake. While that is certainly not the highest out there, Golden Grimoire is still a great game for relaxed play, thanks to its graphic design and animations. If you want a reliable casino where you can play in Rands, Genesis Casino is one of the best ones out there (if not the best). Thanks to its customer-centric practices and a great selection of games, Genesis is gaining more attention these days. South Africa-based players will plenty to like and enjoy at this international casino.